The curtals (dulcians) are copies after instruments in the Berlin Museum for Musical Instruments (Sammlung Preussischer Kulturbesitz). The copies are reconstructed as exactly as possible in 440 Hz or 466 Hz. The wall of the instrument is not very thick which makes it slimline and extremely light. The material used is oiled and stained maple. The instruments have, like the originals, two keys and no double holes. The crook (wall thickness 0.7mm) is cut from sheet brass, soldered, fitted precisely over a pin and shaped by hand using the exact historical technique. As a result of this attention to detail, our dulcians are delicate instruments which can be played with many nuances and which always produce a full and rich tone. 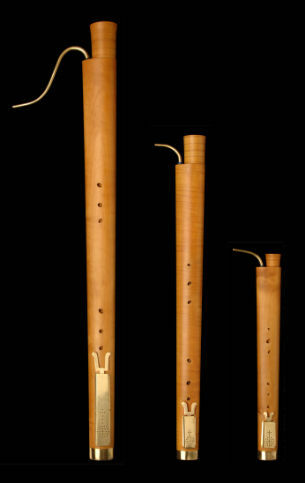 Dulcian, baroque, classical and modern bassoons. "the ensemble's best and most supple work was in the four Vivaldi concertos... Among them was a lively account of a bassoon concerto (RV 483), with Dominic Teresi playing the solo line gracefully." Dominic Teresi is playing the 440 Bass Dulcian after the Berlin original.